Filming for a new series of the BBC's Top Gear programme has resumed, 15 days after presenter Richard Hammond crashed in a jet-powered car. The accident happened as Hammond was doing speeds of up to 300mph as he was being filmed. He suffered a brain injury but doctors were amazed by the initial rapid progress of his recovery. A BBC spokeswoman said: "We are resuming filming parts of the next series that don't involve Richard." Despite production being back up and running it is still not clear when the new series will actually be broadcast. "The next series will not be scheduled until we have further news of Richard's progress. 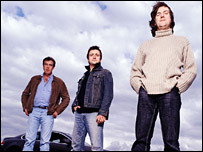 We remain committed to the future of Top Gear," the spokeswoman added. "What we've always said is that of course filming was postponed after Richard's accident and now it has resumed. We're delighted by that." Jeremy Clarkson was back in front of the camera test driving a Lotus Europa at Dunsfold Park Aerodrome in Surrey. Hammond and his wife, Mindy, have been made aware that filming has started again and are said to be happy with the news. Messages of support flooded in when the news of Hammond's accident was released. Well-wishers also sent donations to the air ambulance which flew the star to hospital. The 36-year-old had been driving a jet-powered Vampire dragster when it veered off the track at Elvington airfield, near York, in September. The vehicle flipped over several times and crashed onto nearby grass. Hammond was rushed to Leeds General Infirmary where he received treatment for a brain injury. 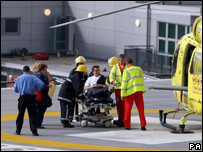 After recovering more quickly than medical staff had predicted, the presenter was moved to a hospital in Bristol.